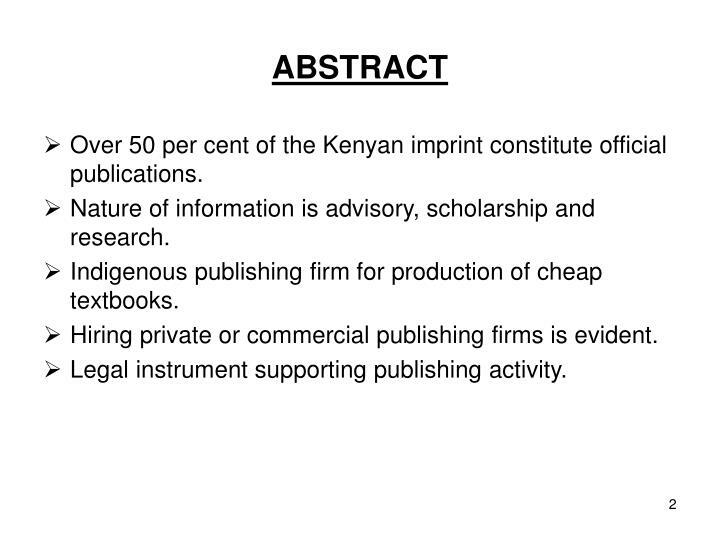 Over 50 per cent of the Kenyan imprint constitute official publications. Nature of information is advisory, scholarship and research. Indigenous publishing firm for production of cheap textbooks. Hiring private or commercial publishing firms is evident. Legal instrument supporting publishing activity. Ministries and department, local governments (councils), judiciary, parastatal organizations, commissions and government education institutions. Legal matters, education, agriculture, economics, health and environment. 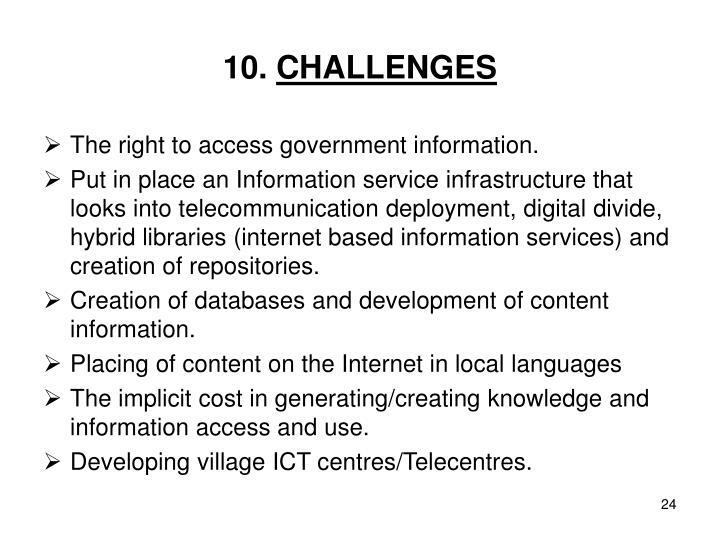 To impact on the day today lives of Kenyan citizens requires: appropriate format, timely access, cheaply and adequate. curriculum in terms of textbooks. 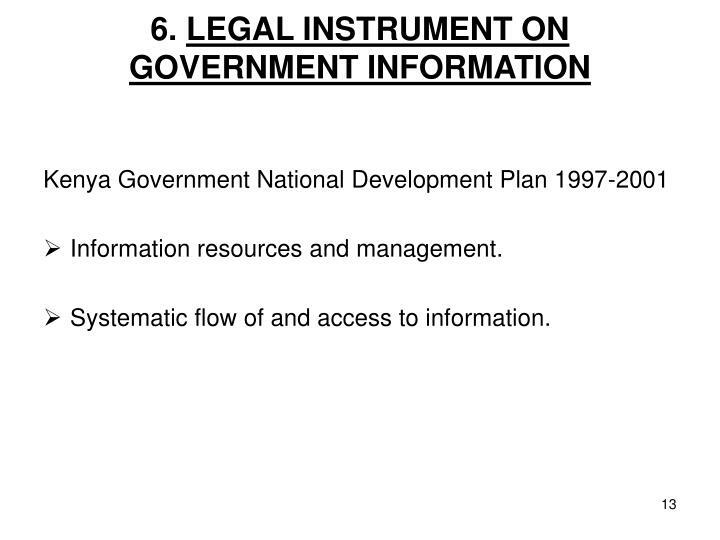 The Kenya Government National Development Plan 1997-2001 provides for information resources and management. The Kenya Gazette Supplement No. 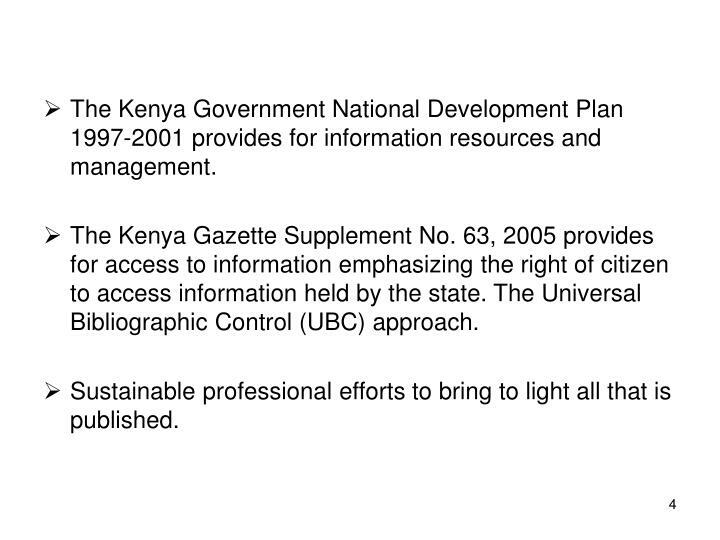 63, 2005 provides for access to information emphasizing the right of citizen to access information held by the state. 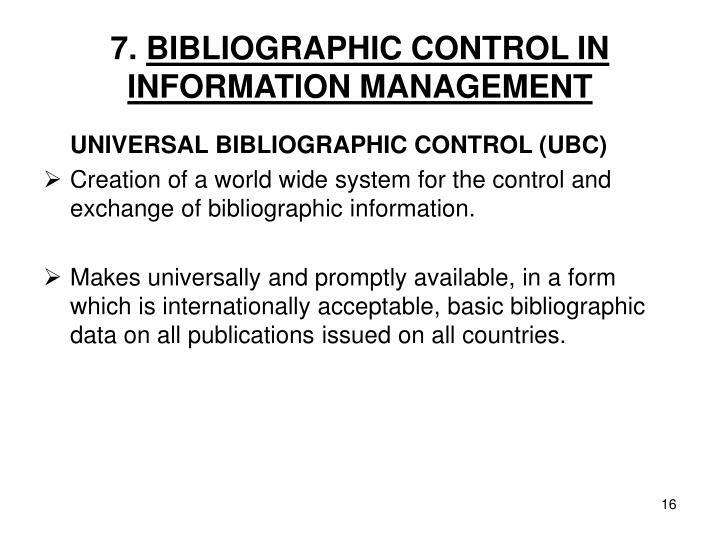 The Universal Bibliographic Control (UBC) approach. Sustainable professional efforts to bring to light all that is published. Parastatal reports and research finds use in further research, planning, education, training and extension. 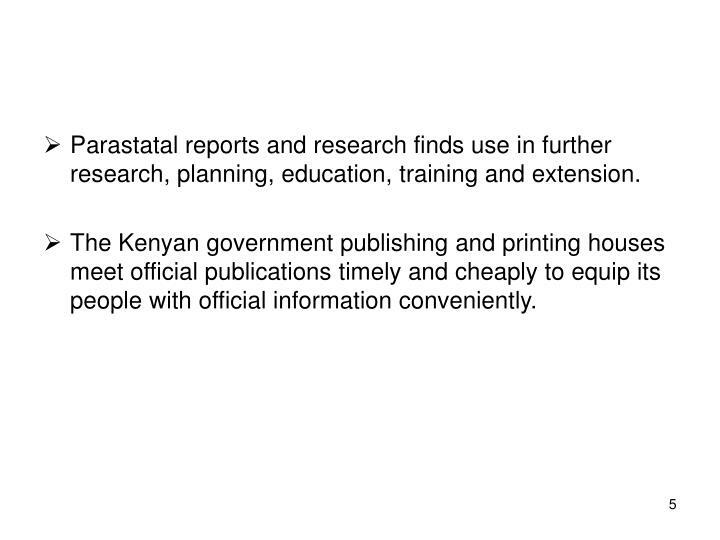 The Kenyan government publishing and printing houses meet official publications timely and cheaply to equip its people with official information conveniently. Multiplicity of Government publishing lines, nature, range and scope of publications. 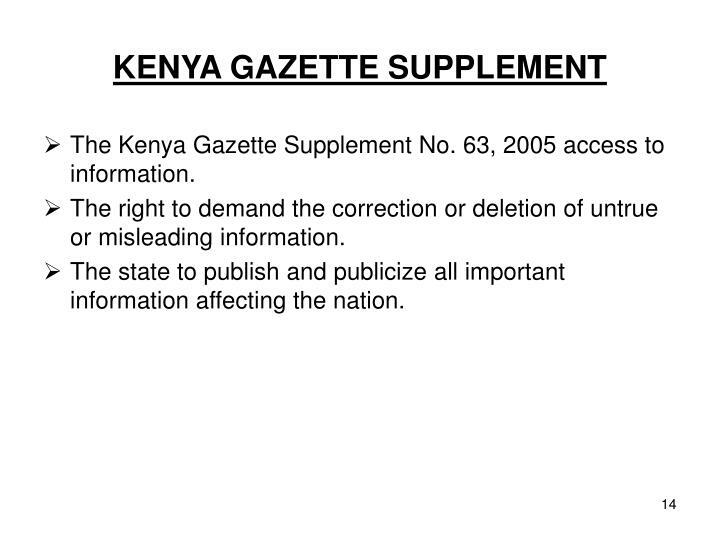 The Kenya Government publications lie in situ. Professional and international efforts to bring to light all that is published for common good requirement. 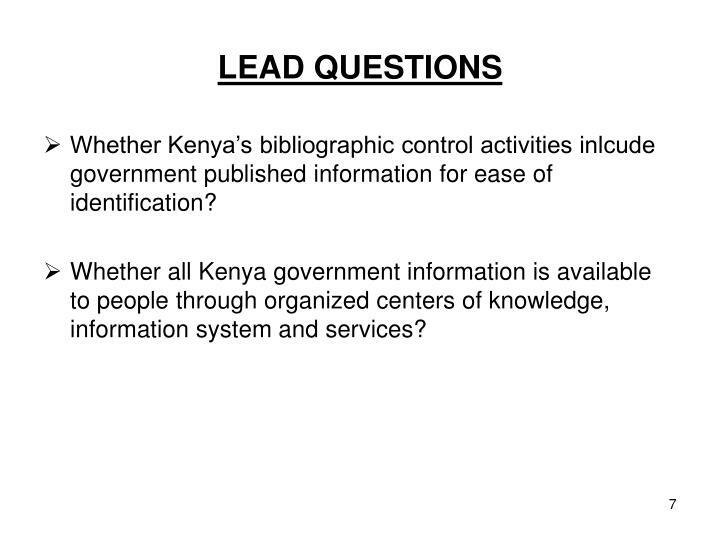 Whether Kenya’s bibliographic control activities inlcude government published information for ease of identification? 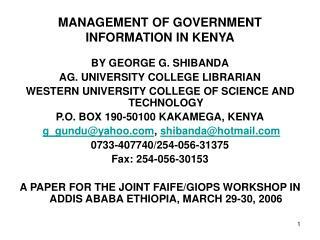 Whether all Kenya government information is available to people through organized centers of knowledge, information system and services? 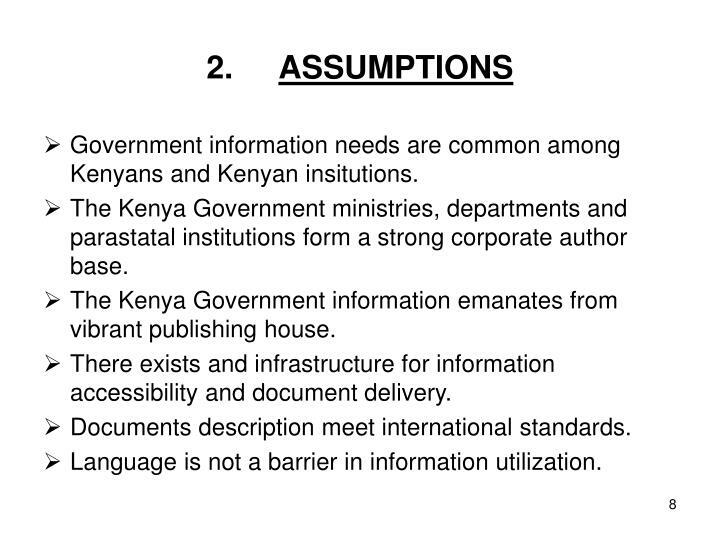 Government information needs are common among Kenyans and Kenyan insitutions. The Kenya Government ministries, departments and parastatal institutions form a strong corporate author base. 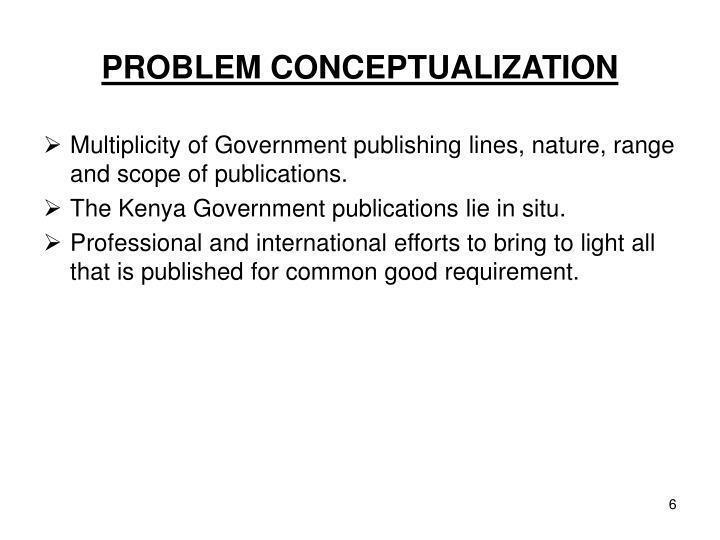 The Kenya Government information emanates from vibrant publishing house. 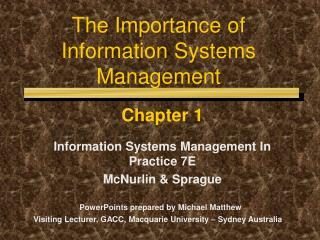 There exists and infrastructure for information accessibility and document delivery. Documents description meet international standards. Language is not a barrier in information utilization. 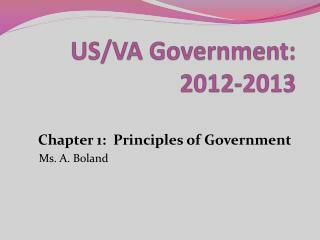 Access to government policy and legal matters. Involve official bodies at all levels annually. Important and authoritative in nature. Contain legislation, statement of government policy, debate on current topics of importance, reports of government sponsored research, official histories, statistical data. 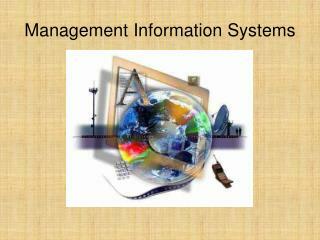 Information appears virtually in all subject format including book, periodical, map, electronic. 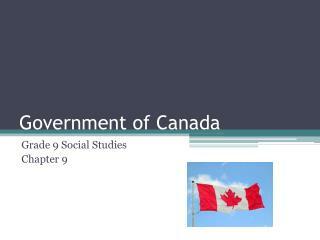 Government Printers covers reports, legislation, government policy reports and statistics. 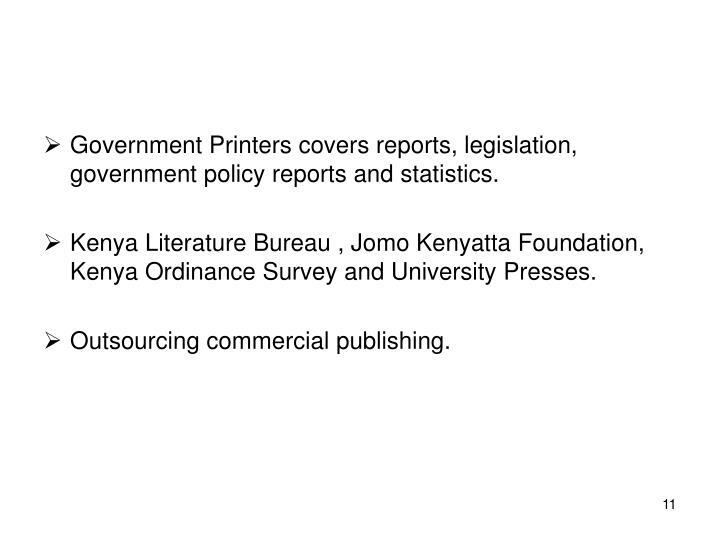 Kenya Literature Bureau , Jomo Kenyatta Foundation, Kenya Ordinance Survey and University Presses. 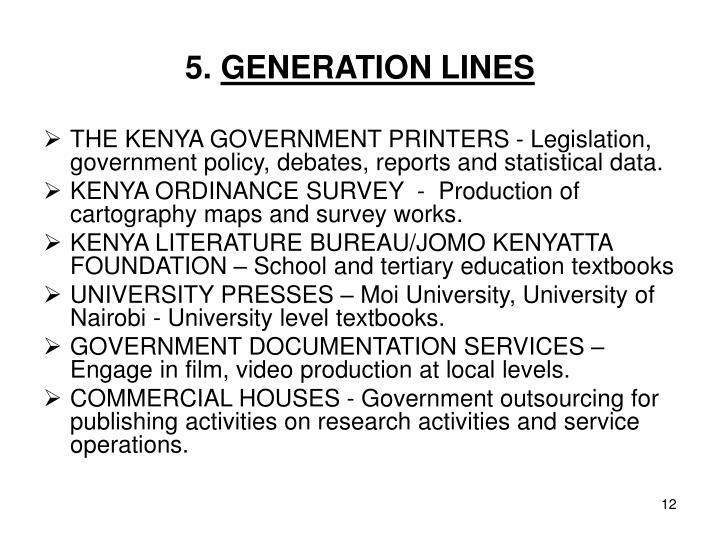 THE KENYA GOVERNMENT PRINTERS - Legislation, government policy, debates, reports and statistical data. 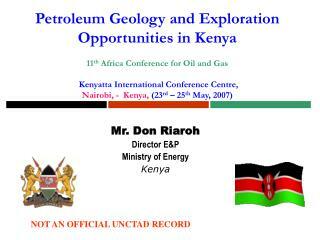 KENYA ORDINANCE SURVEY - Production of cartography maps and survey works. UNIVERSITY PRESSES – Moi University, University of Nairobi - University level textbooks. GOVERNMENT DOCUMENTATION SERVICES – Engage in film, video production at local levels. COMMERCIAL HOUSES - Government outsourcing for publishing activities on research activities and service operations. 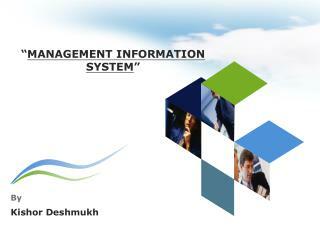 Systematic flow of and access to information. The Kenya Gazette Supplement No. 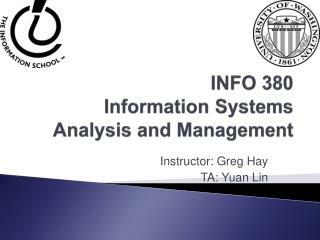 63, 2005 access to information. The right to demand the correction or deletion of untrue or misleading information. 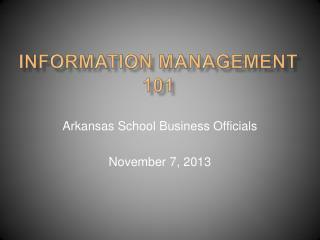 The state to publish and publicize all important information affecting the nation. Registrar to keep returns and registers of books and newspapers. Exempts books and newspapers printed or published by or on behalf of the Government. 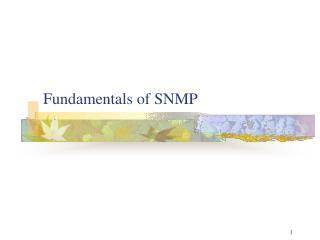 Kenya National Library Services (KNLS), Kenya National Archives and the University of Nairobi are depository centres. 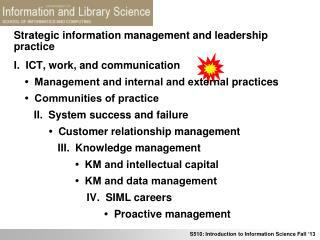 Creation of a world wide system for the control and exchange of bibliographic information. Makes universally and promptly available, in a form which is internationally acceptable, basic bibliographic data on all publications issued on all countries. 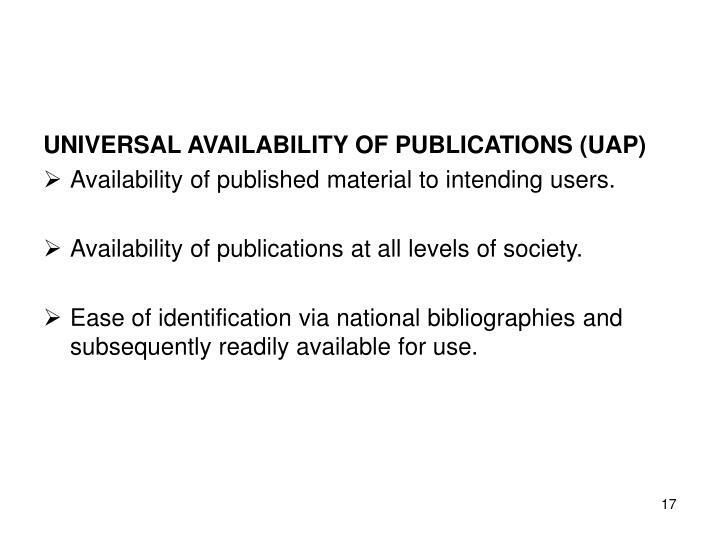 Availability of published material to intending users. Availability of publications at all levels of society. Ease of identification via national bibliographies and subsequently readily available for use. 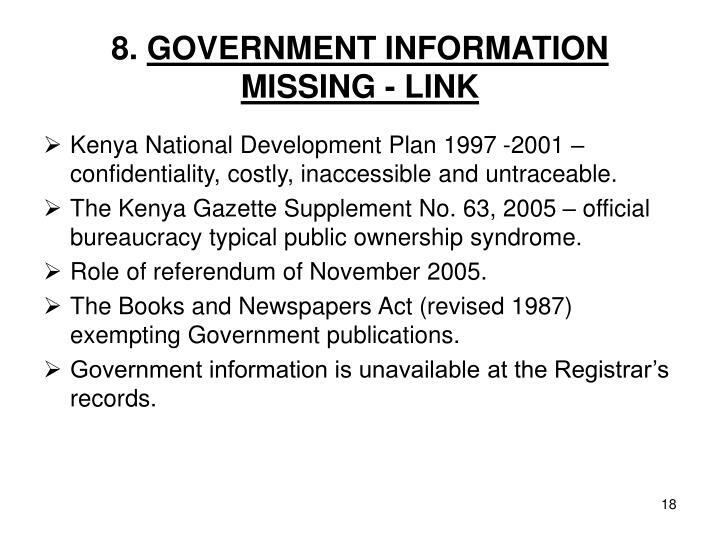 Kenya National Development Plan 1997 -2001 – confidentiality, costly, inaccessible and untraceable. The Kenya Gazette Supplement No. 63, 2005 – official bureaucracy typical public ownership syndrome. Role of referendum of November 2005. 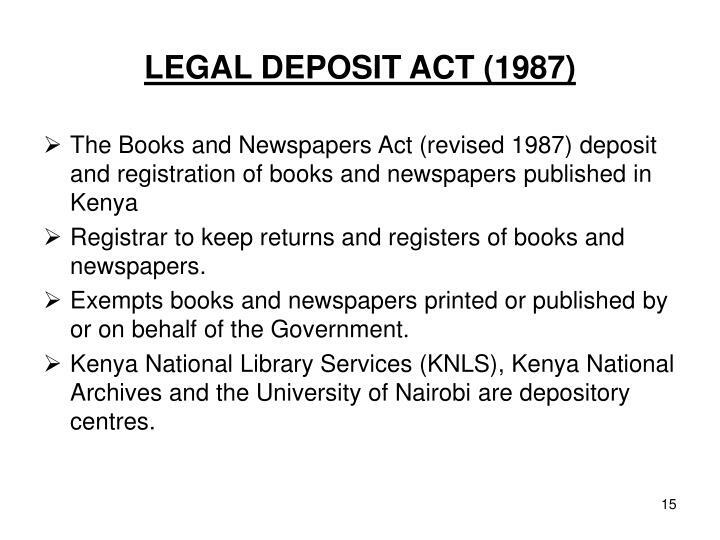 The Books and Newspapers Act (revised 1987) exempting Government publications. Government information is unavailable at the Registrar’s records. 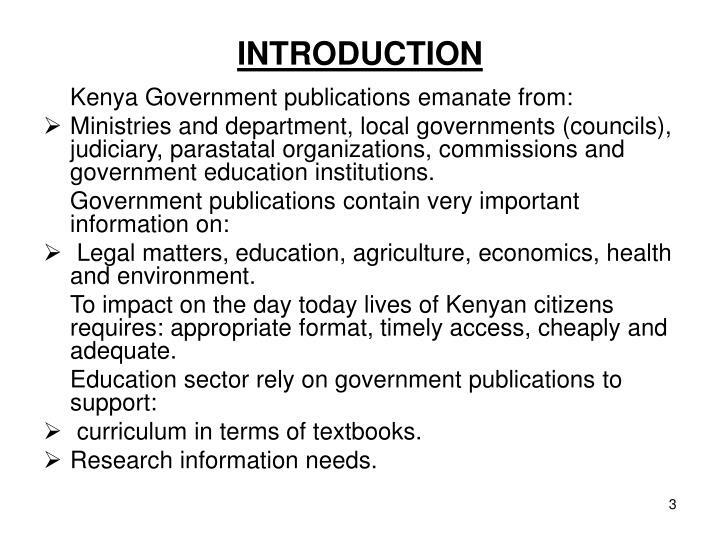 Kenya National Bibliography (KNB) – Inadequate coverage. Legal exemption on Government publications. Lacks conformity with the UAP programme concept. 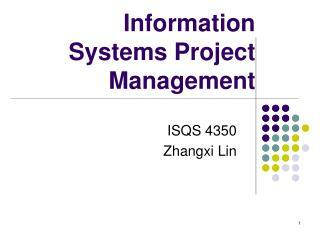 Lacks international standard Book numbers and International Standard Serial Number. 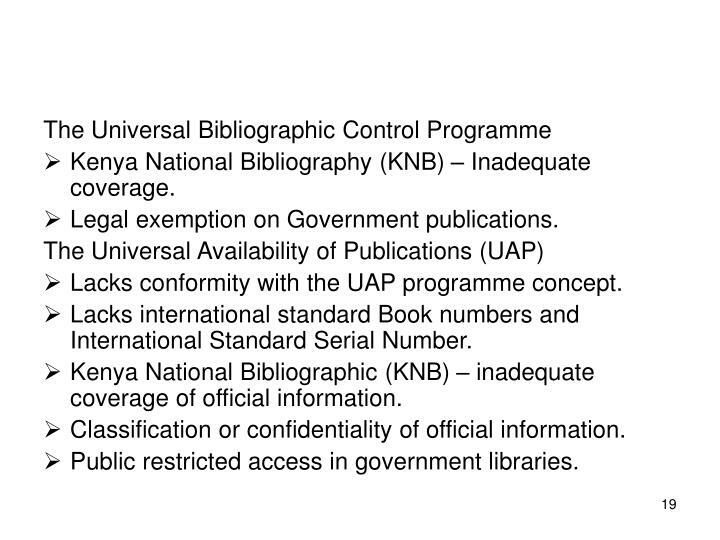 Kenya National Bibliographic (KNB) – inadequate coverage of official information. 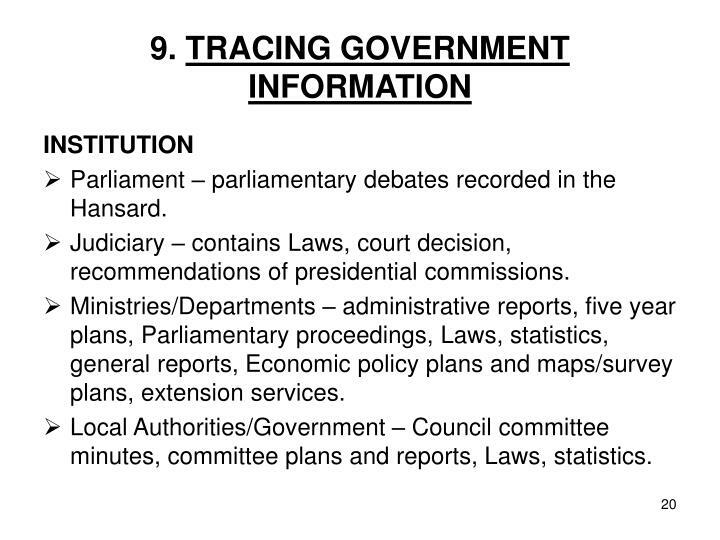 Classification or confidentiality of official information. Public restricted access in government libraries. Parliament – parliamentary debates recorded in the Hansard. Judiciary – contains Laws, court decision, recommendations of presidential commissions. Ministries/Departments – administrative reports, five year plans, Parliamentary proceedings, Laws, statistics, general reports, Economic policy plans and maps/survey plans, extension services. Local Authorities/Government – Council committee minutes, committee plans and reports, Laws, statistics. 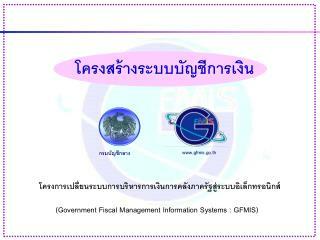 Government Printers Catalogue – available catalogue on government publications is 1977 edition. Government Printers Bookshop is the current source. Kenya Gazette – weekly publication by the Government Printers. It lists all government publications published by the Government Printers. 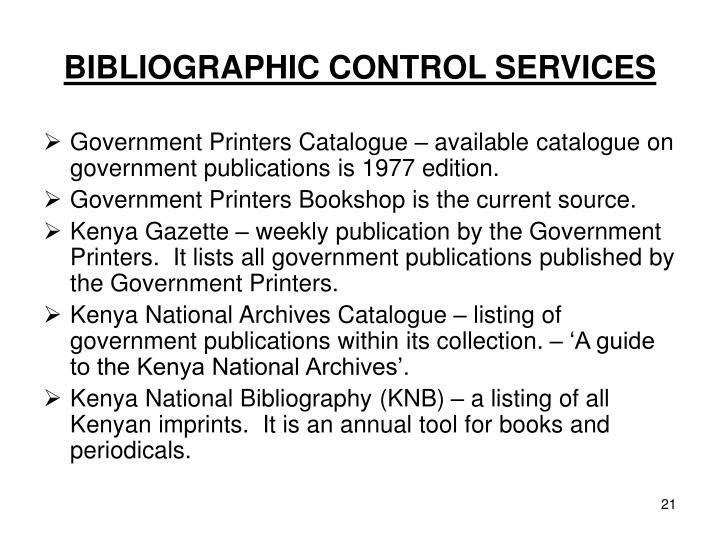 Kenya National Archives Catalogue – listing of government publications within its collection. – ‘A guide to the Kenya National Archives’. 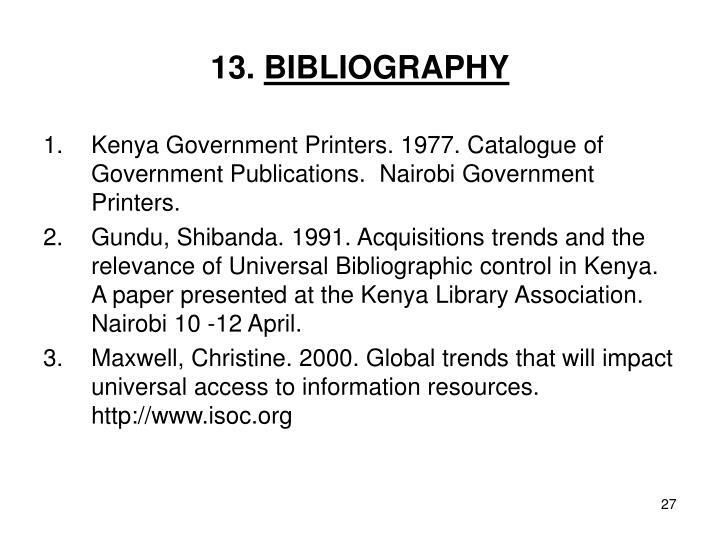 Kenya National Bibliography (KNB) – a listing of all Kenyan imprints. It is an annual tool for books and periodicals. 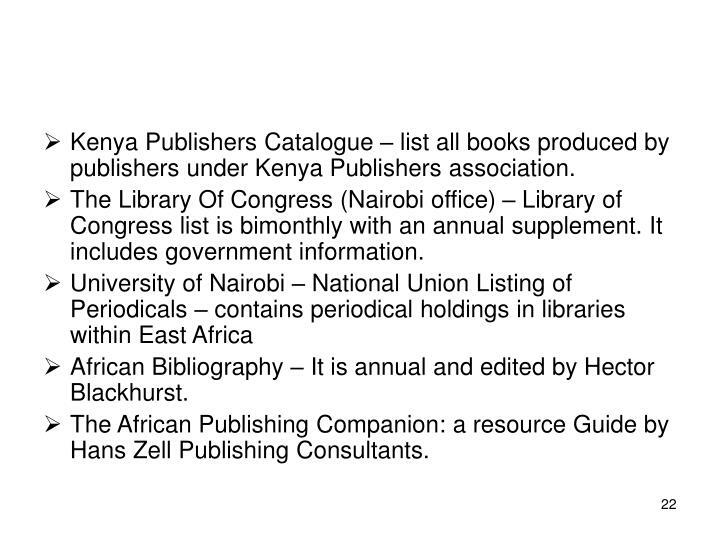 Kenya Publishers Catalogue – list all books produced by publishers under Kenya Publishers association. The Library Of Congress (Nairobi office) – Library of Congress list is bimonthly with an annual supplement. 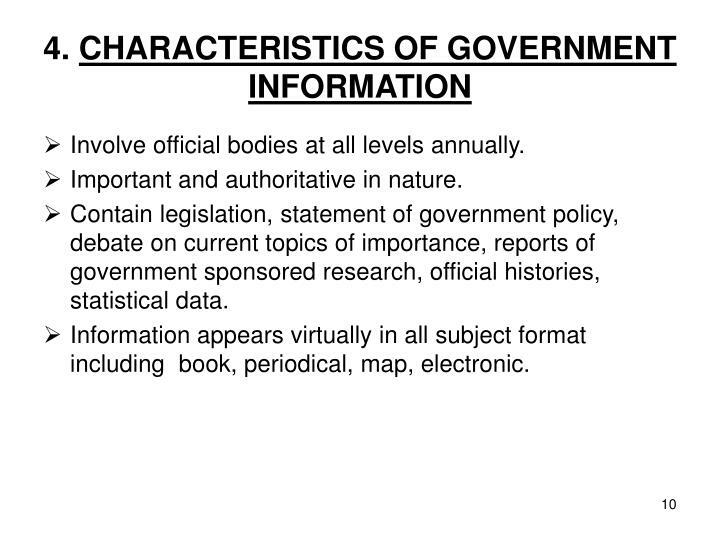 It includes government information. African Bibliography – It is annual and edited by Hector Blackhurst. 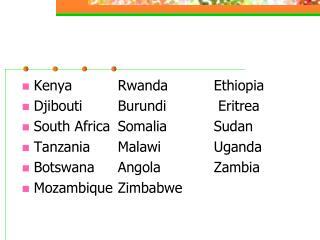 The African Publishing Companion: a resource Guide by Hans Zell Publishing Consultants. 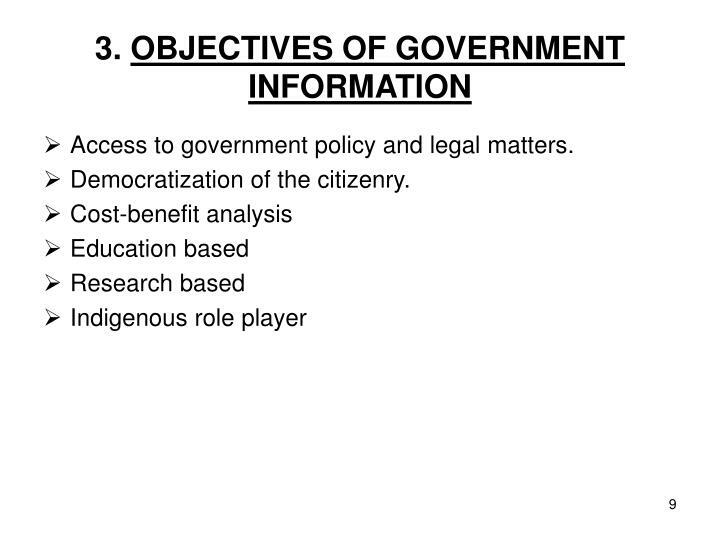 The right to access government information. 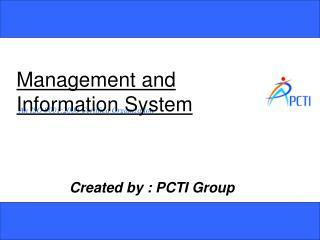 Put in place an Information service infrastructure that looks into telecommunication deployment, digital divide, hybrid libraries (internet based information services) and creation of repositories. 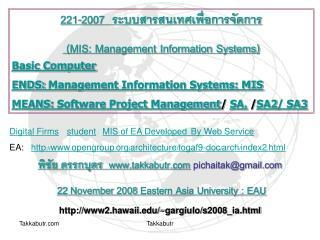 Creation of databases and development of content information. 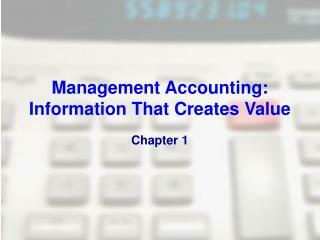 The implicit cost in generating/creating knowledge and information access and use. 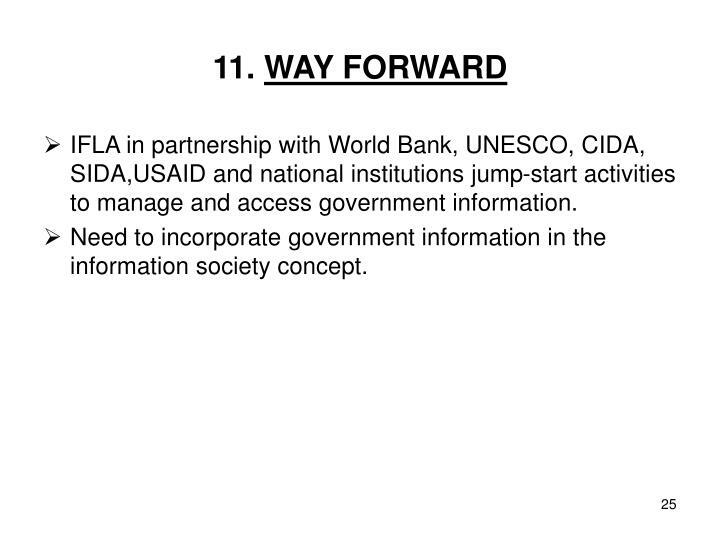 IFLA in partnership with World Bank, UNESCO, CIDA, SIDA,USAID and national institutions jump-start activities to manage and access government information. 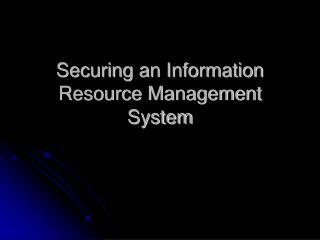 Need to incorporate government information in the information society concept. 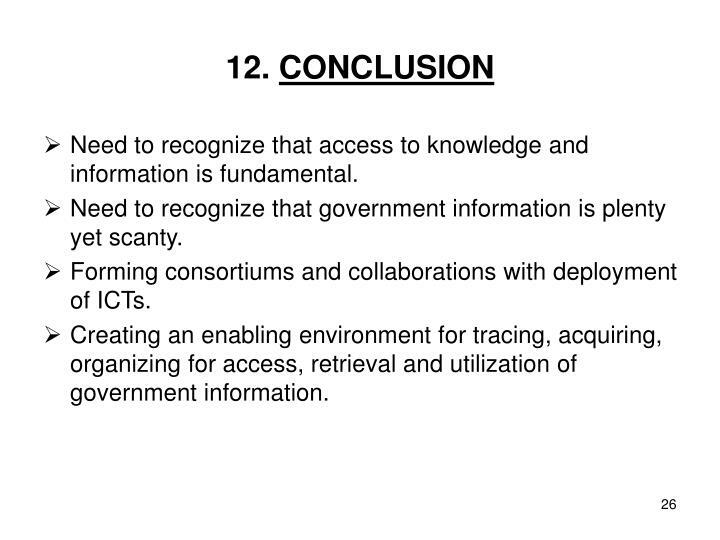 Need to recognize that access to knowledge and information is fundamental. 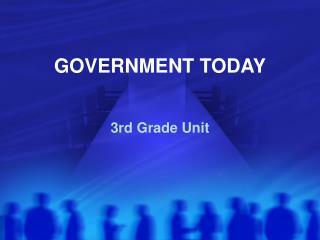 Need to recognize that government information is plenty yet scanty. Forming consortiums and collaborations with deployment of ICTs. 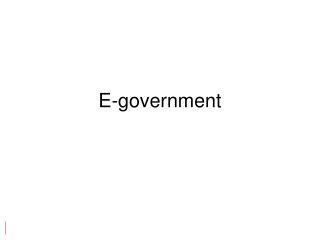 Creating an enabling environment for tracing, acquiring, organizing for access, retrieval and utilization of government information. Kenya Government Printers. 1977. 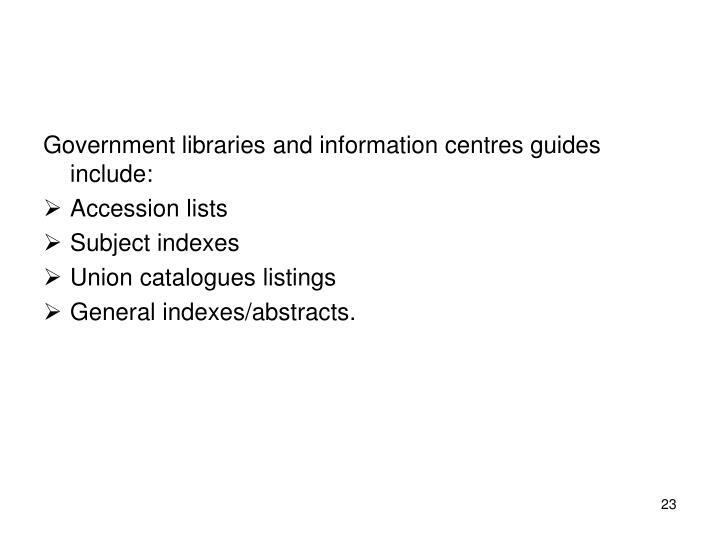 Catalogue of Government Publications. Nairobi Government Printers. Gundu, Shibanda. 1991. 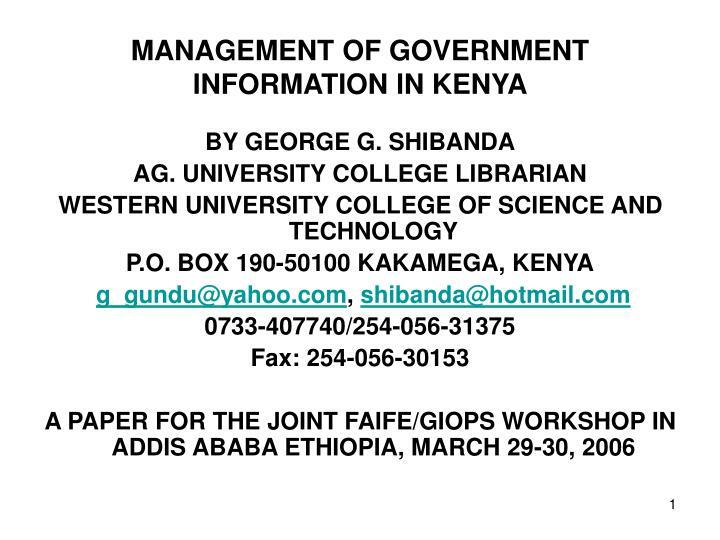 Acquisitions trends and the relevance of Universal Bibliographic control in Kenya. A paper presented at the Kenya Library Association. Nairobi 10 -12 April. 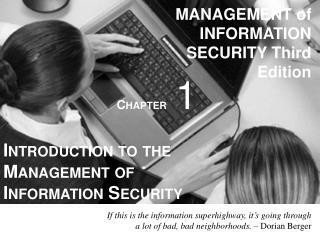 Management of Information Security Chapter 06 Security Management Models And Practices -. 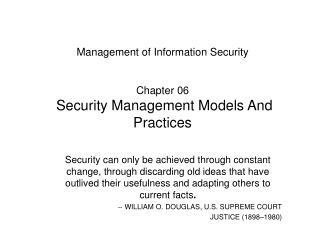 security can only be achieved through constant change, through discarding old ideas that have outlived their usefulness and adapting others to current facts .